I imagined Americans were heading to Martha's Vineyard this summer, while I chose a different adventure... I joined the small number of European and American women who ventured into IRAN and abided daily by one single rule: Hair and body must be covered with fabric when stepping outside of the house. I've traveled in my life, and prepared for trips before, but really nothing emotionally or physically prepared me for what awaited me in Iran. Here are some of my thoughts in retrospect. B began discussing his wish to return to his country after 22 years of absence. I always had the dream of returning to the Middle East since... well, since I left Egypt at the age of 7. When he started naming dates, faring fares, and putting it in for visa, I did what I could to make it possible for myself to go along. The Iranian Embassy in Paris was were I went, two weeks before B flew in, to have the visa stamped in my French passport. I was told a cover was needed inside the symbolic territory of the Embassy, and I had borrowed a manteau from a friend. I put it on before going into the Metro, but I left the scarf until I had arrived closer to the premises. The looks I got in the Metro from other women said to me, "Are you crazy? It's hot. And, what are you anyways? Half Moslem, half covered, with a coat and no scarf..." Or, perhaps that was how it felt to me then. Near the Embassy, I began to struggle with the slippery scarf, my bangs, and my vanity. I entered and I was the most covered woman in the hall. I've heard Iran described with contrasts. That is possibly an understatement. It soon became clear that if women followed only one rule (cover her hair and body with fabric) then pretty much EVERYTHING ELSE was permitted. And not only women: anyone can turn his car into a taxi, four people in back three to four up front... no problem. No limit to the number of people (nor anything else, for that matter) on a motorcycle. If three painted lanes divide the width of the motorway, four lanes of traffic may straddle them easy. No right of way for pedestrians. Sell anything you'd like on the sidewalk. Refill disposable lighters for profit. Courage and force is what they need, the rest is taken care of by the almighty. All this was first shock then complete entertainment. Come to think of it, there may be a link between women's dress code and the fantastical driving; German autobahns prohibit advertising presumably because it may cause split-second distraction to the fahrer guzzling at 120mph. 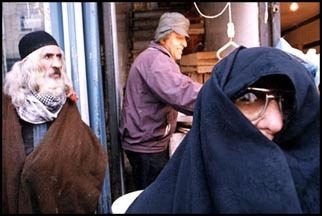 In Iran the cover is averting longer glances. Really, if you saw the driving, you'd know why I was fascinated... it's an Art. We agreed that improvisation in driving was somehow characteristic of a population that had seen war and was now in the throes of economic chaos. Each day was an adventure, and each activity revealed possibilities and circumstances out of the ordinary, into the wondrous and the unexpected. We drove a long, dry, hot, dusty, polluted way to see our friends, and were welcomed with open arms, tea, watermelon, cherries, and cucumbers. We visited a family out in the country living between mud walls, with an outhouse in the garden. In the village we discovered the most beautiful bathing spot... the public baths. How about food in Iran? It is good, you ask. The answer is an emphatic YES. With the exception of kabob, home is where the good food is. Restaurants mainly serve kabob, and we found some other local specialties... goat's head soup, olive oil sautéed chicken, or burgers in a pizza shop with pictures of Mexican guacamole on the menu. The scarf deterred me from just running out at any moment to the local grocery. For me the scarf wearing was a ritual. For others it had become second nature. In the summer sizzle, I would try to joke, "I'd better not go out without a coat and scarf, it is too hot!" In the circle of women, we would complain about the scarf, but I realized that we never complained about the coat, or the long shirt. The first week I was there I enjoyed the novelty of the scarf, the next week I found myself restricted by it, I didn't like the way it felt like a yolk, it pulled my head down, later I began to think what was so ugly about my body that I must hide it. Near the end of the journey, in a restaurant serving dinner on flat beds with Persian rugs I wondered what would happen if I took my scarf off. "Let's find out," said B. From the moment it came off I was counting the seconds. The tally came to 20 before I put it back on to avoid having someone warn us about it. Afterwards I felt I had been rude to other women in the restaurant. From then on the scarf became my link with women, the mutual agreement to wear it to keep the radicals happy and the "game" fair. B said that the scarves kept him from being distracted, unlike Paris where advertisers were plastering breasts in every metro station promoting "Celio, It's the man." We left Paris, the city of lovers, and arrived in the ISLAMIC REPUBLIC OF IRAN. In Paris couples were kissing, hugging, and cuddling, in Iran you might catch a few couples holding hands. In Paris they seem to be leaving their churches to be restored to last, as they now serve only as museums. In Iran prayer and God are with you everywhere. I've never seen so many people pray. The call to prayer is satisfying, and reassuring. We went for a walk in the woods near the restaurant where we ate kabob. There were families on blankets picnicking, carrying stoves for tea, and washing their plates in the springs. Then, one person started to pray, while the others carried on with their picnic. Three things challenged me: the language, the restrooms, and the fine art of manners. I know some basic household Farsi, so the first ten days were the toughest as I had much vocabulary to learn. I felt as though I was constantly asking, "what did he say?" B was busy sharing stories and laughter that he had not experienced in 22 years, and had no time for my innumerable inquiries. When someone would tell a funny story and every one would laugh but me, that was tough. Or little 3-year-old Tara would ask me a question with big eyes, and I'd have no idea about what she had just said. "Sorry, I don't understand," I could at least say in Farsi. Then she'd repeat it again, a bit louder, for me to understand better, after which I'd be running to the nearest adult begging for assistance. Yes, my foot was in my mouth - stuff came out wrong. If you go to Iran, be warned, they have (as the French call them) Turkish toilets. This means you squat, and they have a hose nearby with which to wash yourself afterward; however, they don't always have tissue paper (upon my return to Paris, I found out that women carry Kleenex, ooooh of course! Next time I shall). Also, it is hard to find that familiar picture next to the restroom sign depicting a man or a woman. I stood for a while staring at the handwritten signs, guessing, and then agreeing that it is time for me to learn to read and write Farsi. I have a friend whom I visited in Iran. Years ago, when she met my uncle in California he and she translated a routine Persian expression to this effect: "I draw blood for you in the backyard, I sacrifice myself for you." EVERY SINGLE time we rode a taxi upon asking the driver for the fare the response was: "Nothing to your worth." When purchasing a gift, I asked how much it costs, the answer: "You are a guest in my country and I cannot ask you to pay." I drew blanks. It is proper to first refuse the delicious sweets offered to you then to succumb to the insistence of your host a third or fourth time (even while you are dying to have those wee wonders in your mouth). But you don't do that with the tea. If you compliment a garment a friend is wearing, they offer it to you. Iran is dry and looks like nothing can grow there, but just add water. The rich soil brings beautiful trees and gardens forward like patterns on their carpets. I long for that richness and beauty in my life. I will hopefully return again, despite being an American, and the dangers associated with traveling to a country like Iran. I shall return for the people, the culture, the bazaars, the gardens, the music, the language and those garbanzo flour cookies. I adore traveling back in time to where they still don't have touchtone phones and where they keep the T.V. remote wrapped in plastic. You know there's been a revolution?